Our days will start with morning meditation, poetry, gentle yoga, and quiet practices. Many of our afternoons are left free to enjoy and explore the abundant resources and natural beauty. In the evenings, after dinner, we will gather for a group session that might include: shamanic journeying, chanting, movement, sacred play, sharing, and creative expression. 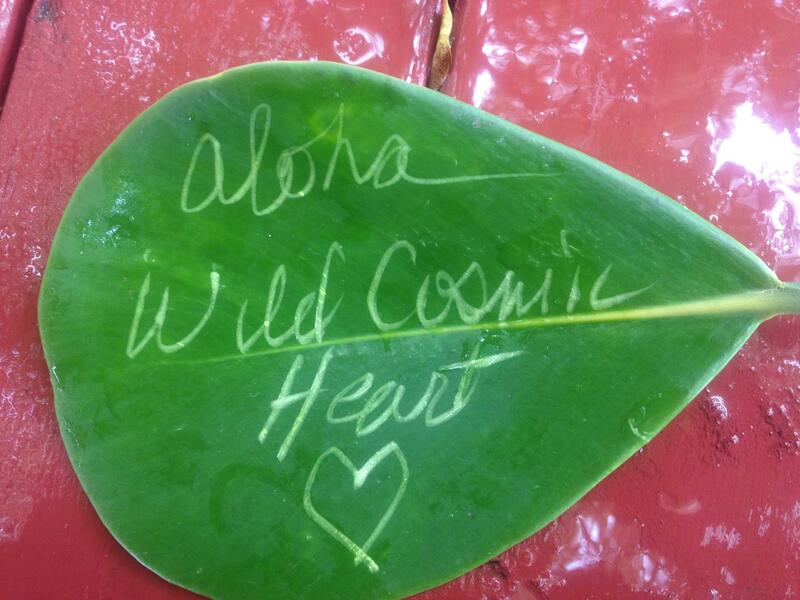 Each practice will give us the opportunity to explore and unearth our wild cosmic heart. COST: $1,475 – Double Lodge Room OR $1,775 – Single Lodge Room INCLUDED: All retreat workshops & yoga classes, 6 nights/7 days accommodations, three meals a day, exclusive workshop space, two half-day Hawaiian adventure tours, a hula class. NOT INCLUDED: Flights between home and Hawaii, optional excursions, airport transfers ($45 if multiple pick-ups or $65 if single pick-up), tips for Kalani staff, and items of personal nature. No experience needed to attend – just an open mind and open heart. A non-refundable deposit of $300 is required to reserve your space for this retreat. To register, email Mary Anne to receive the registration form and/or reserve your spot by paying your deposit on-line using PayPal. Payment in full is requested by August 31, 2013. Registrations are gladly accepted after August 31, 2013 based on availability. CANCELLATIONS AND REFUNDS: Cancellations made prior to August 31, 2013 are subject to the forfeit of all deposit monies paid ($300) unless we can find another person to fill your reservation. Reservations cancelled between September 1 – October 3, 2013 are subject to cancellation fee in the amount of 50% of the retreat cost. Reservations cancelled on or after October 3, 2013 are subject to a cancellation fee in the amount of 100% of the retreat cost and are non-refundable. Mary Anne Flanagan is the founder of Toning the OM™. Toning the OM™ is an international healing arts company that is committed to nurturing heart connections through experiential workshops, retreats, healing, and coaching sessions. Mary Anne is a Certified Life Coach from New York University, a Shamanic Teacher, and workshop facilitator. Mary Anne received a Certificate in Coaching in Medicine and Leadership from Harvard University. She has a private healing and coaching practice in New York City. This entry was posted on Sunday, November 3rd, 2013 at 12:00 am	and is filed under Drumming, Meditation, Mindfulness, Shamanism. You can follow any responses to this entry through the RSS 2.0 feed. Both comments and pings are currently closed.